Clean dishes start with better built parts. And with a motor that's tested to twice the average dishwasher life expectancy, this is an ENERGY STAR® qualified dishwasher you can count on. The Jetclean® Plus wash system removes tough food particles and a 4-blade stainless steel chopper pulverizes food. The Steam Sanitize option feature eliminates 99.999 percent of food soil bacteria, giving you confidence that your dishes are clean. Loading big dishes is simple because the tiered upper rack makes room in both racks for tall items. 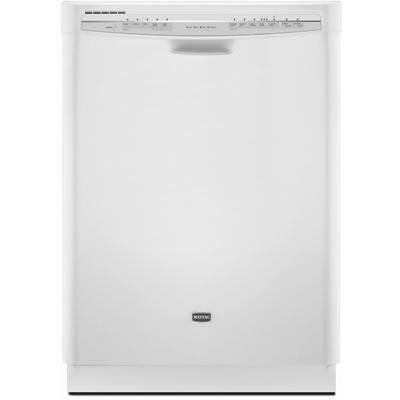 And not only does this hard-working dishwasher get dishes clean, the redesigned 2.5-inch flush console offers a sleek look. Additional Information Rack Material: DuraGuard® Nylon; Targeted Spray Option: Spinner; Heated Dry Option; Steam Sanitize Option; Glassware Cycle Option. Additional Dimensions nimum Height: 33 7/8(86.04cm); Maximum Height: 34 1/2(87.63cm).